Did you know? When underarm skin is irritated by shaving, it can respond by creating dark marks. Whether raising your arms in gym class, raising excitement at the big game or raising the roof at the dance, don’t be ashamed to bare your underarms. Dove® Clear Tone™ Skin Renew Deodorant has a unique formula, made with calendula and sunflower seed extracts, that moisturizes to accelerate the natural skin renewal process, helping to visibly reduce dark marks and even tone with regular use over time, while providing 24-hour odor and wetness protection. Experience superior care for your underarms that stays on skin — not on clothes – and dare to bare your even-toned underarms! 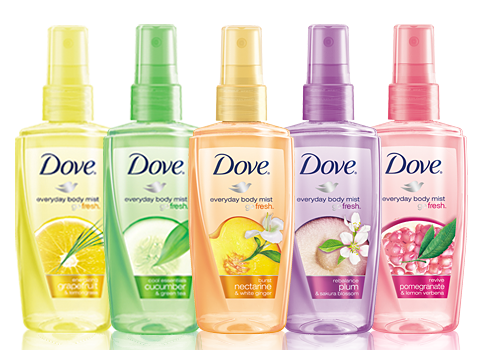 For another layer, try a Dove body mist found in the deodorant aisle. These fragrances will delight your senses and keep pace with your active life. Lightly mist over body for a naturally-inspired touch of long lasting fragrance anytime, anywhere. Keep one in your bag or your locker for quick touch ups throughout the day. Wear loose-fitting breezy clothing to keep the air circulating You can help combat sweat by taking stock of your closet. Your choice of clothing can either make you more comfortable or more prone to sweat. Clothing made of natural fabrics, such as cotton, wool, hemp, silk or linen, often have a looser weave than synthetics; this results in a more breathable fabric that allows air to pass through to your skin. Plus, these fabrics absorb moisture well, which prevents bacteria from feeding on your sweat and causing a stink. Focus on cleanliness to inhibit odor-producing bacteria Clean and buff your underarm area with an exfoliating wipe or gentle body scrub. According to dermatologists, exfoliating helps prevent in-grown hairs and buildup of bacteria. Exfoliate your underarms one to two times per week. This should help keep dark patches at bay while avoiding irritation from too-frequent scrubbing. Remember that scrubbing should always be done gently, as your underarms have delicate skin. Soothe and Protect Finally, use a gentle, nourishing deodorant like Dove® Clear Tone™ Skin Renew Deodorant to help soothe the outer layer of underarm skin that becomes irritated by routine shaving.